Spr (Sapper) C is one of our South Wales based 100 Field Squadron (Militia) unit’s soldiers. 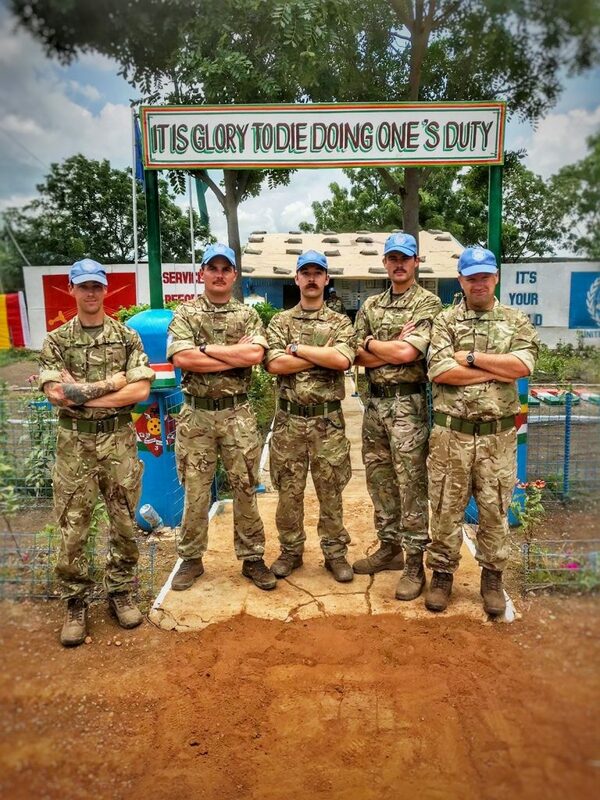 He is currently in South Sudan as part of the UK Armed Forces contribution to UNMISS (United Nations Mission in South Sudan). Here he talks about his experiences so far. When given the opportunity to mobilise with 36 Engineer regiment, many of us within the Mons jumped at the opportunity. In this article I am to summarise some of my key experiences of mobilisation and operations so far. 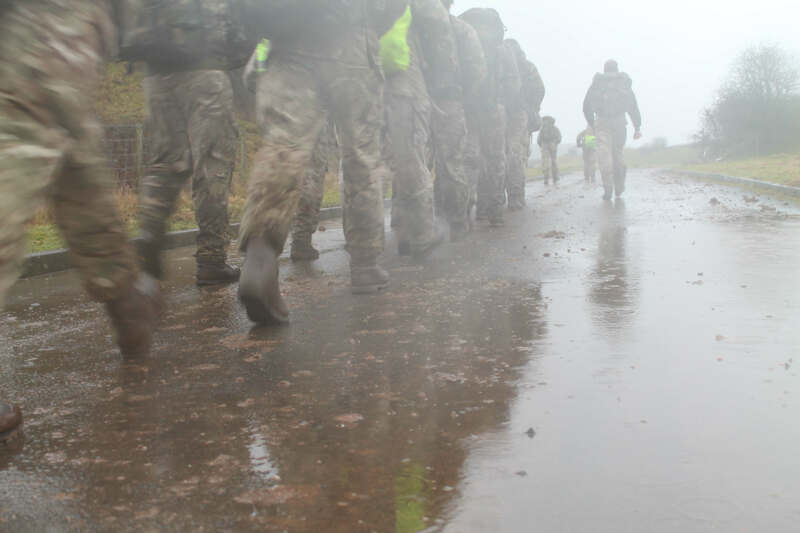 For many of us this was to be our first deployment; in order to prepare us for the challenges ahead the regiment (R Mons) conducted a number of preparatory weekends. The purpose of these was to consolidate our existing knowledge and to advance our skills to the level required. This training was conducted every other weekend at Monmouth; separate from the rest of the regiment and focused at us solely as a cohort. Each weekend concentrated on a different skill, essential either for mobilisation or necessary on operations. These weekends taught us weapons handling (on both the rifle and pistol), CBRN drills, BCD skills, field craft, and marksmanship as well as briefs on what to expect on our year-long mobilisation. Each weekend was progressive; building on what had been taught previously, testing our knowledge and physical capability. This training ensured we were ready for the challenges ahead, proving to ourselves and the regiment that we were suitable for deployment. The first step in deployment was getting through the Mission Training and Mobilisation Centre (MTMC) at Chilwell. Here it was required for us to pass a thorough medical and all of the MATTS (Mandated Annual Training Tests) to level 1 (the highest level, as required for Regular Service and operational deployment). All of this was to be undertaken within 2 weeks and would decide if we were to deploy or be sent back home. For the majority of us this was a very anxious time, wondering if we would be able to reach the standard demanded of us. Within the first two days we were subject to a medical and a PFA. For myself these were the most intimidating, passing both of them early on was a relief, allowing me to focus on the remaining tests. The next 6 days covered all of the classroom MATTS, with the final two days undertaken on the ranges. 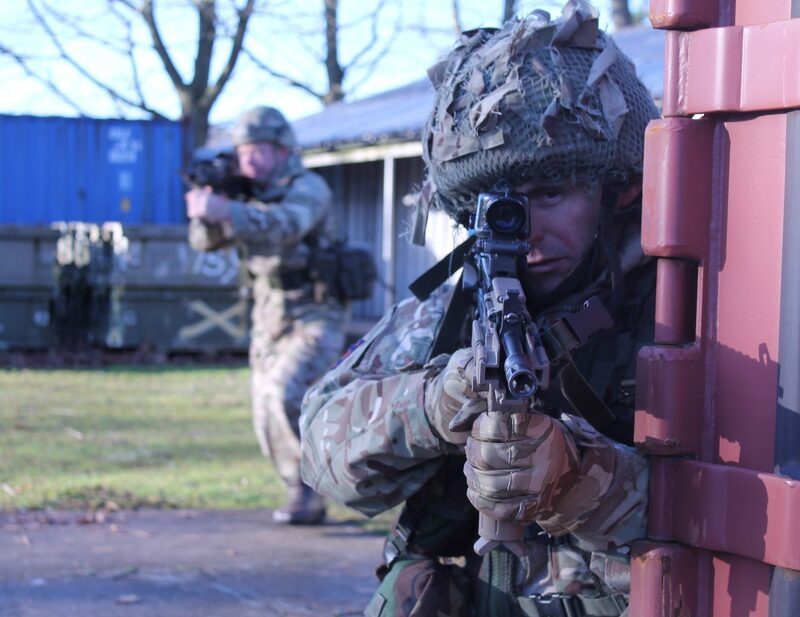 During the range package we would have to pass an ACMT (Annual Combat Marksmanship Test) on both rifle and pistol, a close quarter combat shoot and an advance to contact assessment. With the aid of some last minute coaching, we were put through the tests and all passed. Once the final administration was completed on the Friday morning we were released from Chilwell and officially transferred to 36 Engineer Regiment down in Maidstone. Arriving at Maidstone, we were given our rooms and timings for the ‘All Ranks Briefing’ (used to be called OPTAG) to be held down in Lydd camp the following week. The All Ranks Briefing (conducted by MTMC) consisted of both lectures and practical lessons that would give us the knowledge and skills that would be required in South Sudan. 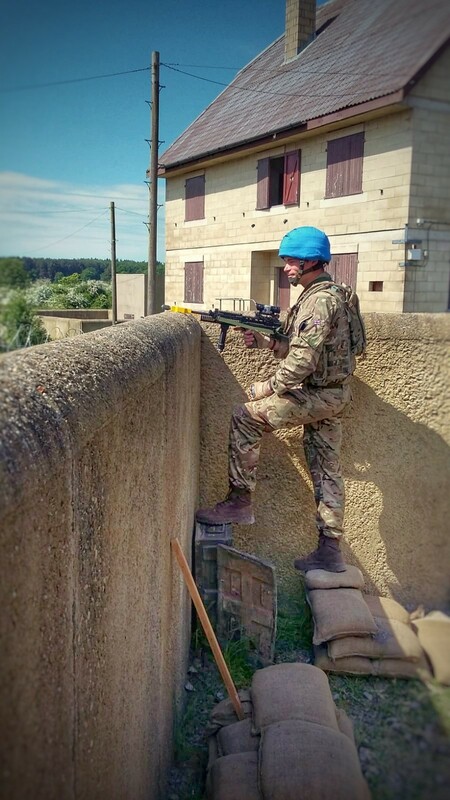 This covered topics from the history of the UN, through escape and evasion, to the culture of other Troop Contributing Countries (TCCs) and contact drills undertaken on the urban training area. This also provided us with the invaluable opportunity to meet some of the people we would be spending the next 6 months living and working alongside. Some of this interaction was undertaken in one of the many watering holes that Lydd has to offer the discerning soldier. 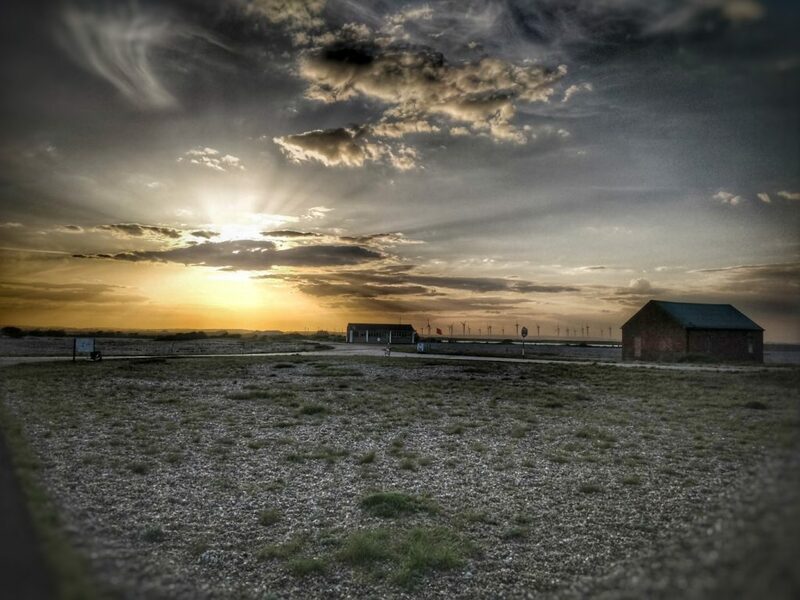 Subsequent to the ‘All Ranks Briefing’ we found ourselves back down at Lydd, this time on the ranges, undertaking a comprehensive shooting package to further develop our marksmanship skills. Over the week we conducted a number of serials, including transitional shoots, night shoots, defensive shoots, advance to contact serials and close quarter combat. By this point everyone was feeling confident in their skills, and a healthy element of competition was apparent, with shooters comparing scores and joking with those who had not done as well. The friendly competition culminated in the final defensive serial where we were all given 10 rounds and 30 seconds to take down as many targets at different distances as possible. Maximum effort from all firers was ensured with the offer of a can of coke as a prize to the best shot. After a tense shoot I emerged victorious, (admittedly only as a lucky ricochet took down two targets with a single round) and claimed my well-deserved prize. So far all of the training we had undertaken to this point had been preparing us for the challenges we would face in South Sudan. Before we could deploy we were required to undertake a Mobilisation and Readiness Exercise (MRX), this was conducted on STANTA training area and would consist of a 10 day assessment in the field. The first few days of the exercise allowed us to shake out and prepare ourselves before we moved into the assessment phase where MTMC subjected us to a number of serials testing our capabilities. These serials included IDF attack, camp infiltration, construction tasks, mass casualty incidents and civil unrest. Despite all of the serials undertaken, we managed to find some downtime, and a friendly game of cricket was organised between ourselves and the Grenadier Guards. As cricketing equipment was not readily available we had to improvise. The bat was made from a wooden slat taken from a pallet, the ball from sniper tape, the wicket out of ammunition cans and the pitch from a section of road at the edge of camp. To our eternal shame the Grenadiers triumphed over the engineers, this was however mainly due to poor fielding exacerbated by the presence of Dannert coil across the pitch. Since starting the mobilisation process at Chilwell, we had all been kept very busy with very little time off. In order to ensure we were well rested and prepared for our time in South Sudan we were all given 3 weeks leave pre-deployment leave. This all allowed us a final opportunity to see friends and family before departing, and was well received. 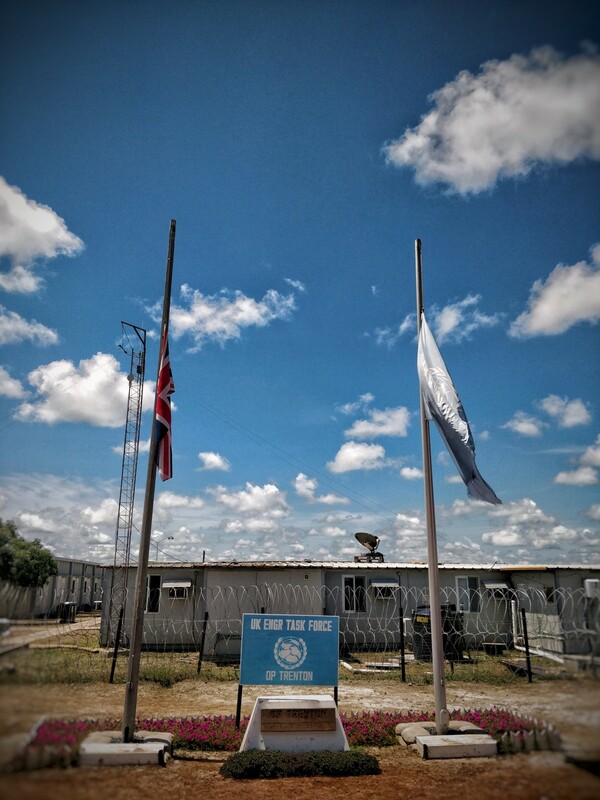 Arriving in Juba was a shock to the system, in less than 24 hours I had gone from the comforts of a business lounge to the capital of a divided nation. The sight that greeted us from the window of the aircraft was that of mud roads, decaying hotels, abandoned planes and cannibalised helicopters. 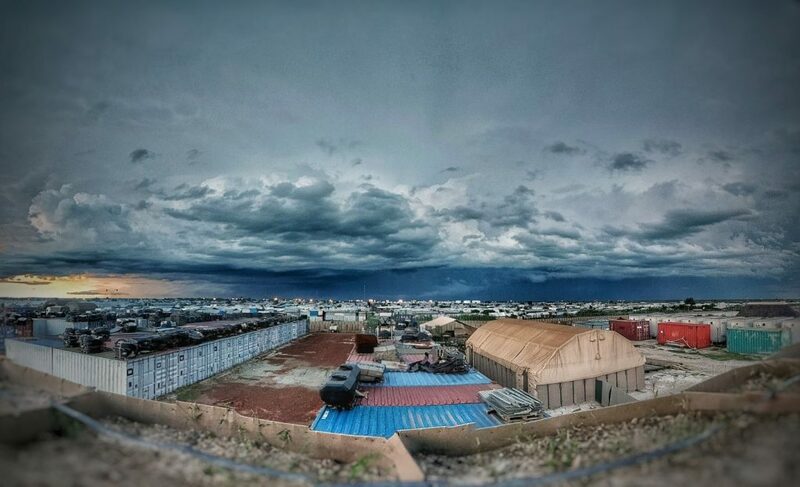 Our first night in the county was spent in transit accommodation adjacent to the airport, preparing for our onward flights and adjusting to life in South Sudan. 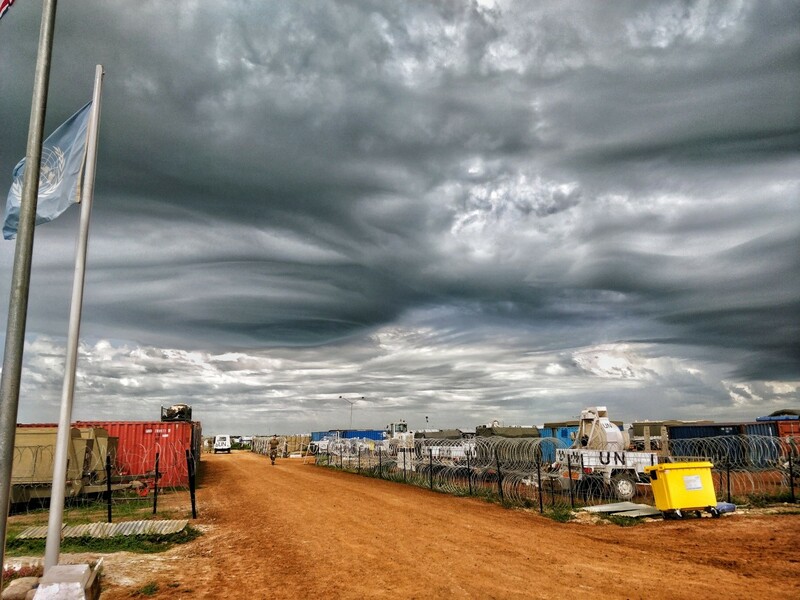 Arriving at the UK camp (located within the Malakal Protection of Civilians site), we were all surprised how well established and equipped the base was. The base itself is small and very compressed (only measuring 150m x 150m), but surprisingly comfortable. We were all expecting something a little rougher and more basic than what we were presented with. The camp itself is equipped with Wi-Fi, there is a well-stocked gym, most buildings have air conditioning, there’s a 12 hour laundry service and a well-equipped welfare facility with as much BFBS (British Forces Broadcasting Service) as we can watch. 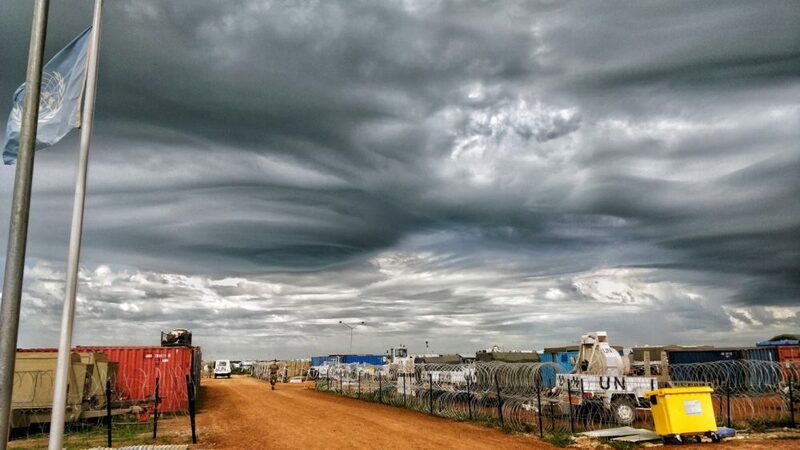 There are a few down sides to life however in South Sudan. The first is the cost of luxuries like soft drinks and chocolate, provided courtesy of the UN shop. Shower gel for example works out to be the equivalent of £9.50, needless to say post and regular resupplies from the UK has become very important to us all. The second is the bipolar nature of the weather, which fluctuates between oppressive heat and torrential rain. The rain has a massive effect on our capabilities, as there are no paved roads movement becomes problematic with vehicles struggling to make headway in the clinging mud. The wet weather also encourages many of the bugs and creepy-crawlies out of their hiding places. The size and quantity of some of the insects is crazy, beetles the size of a mouse, moths as big as a sparrow and crickets swarming in their thousand. The presence of all these creatures makes a trip to the cook-house or the shower a much more challenging experience. Before we were able to start operational activities we had to undergo a local Reception, Staging, Onward movement, and Integration (RSOI) briefing. The purpose of this was to give us an enhanced level of local knowledge, beyond that which we were provided on the ‘All Ranks Brief’. This included a camp orientation, intelligence situation, threat levels, ‘stand to’ procedures and a medical brief. The later I’m sure was included merely to scare us, and convinced the majority that we would die prematurely of some horrible tropical disease. 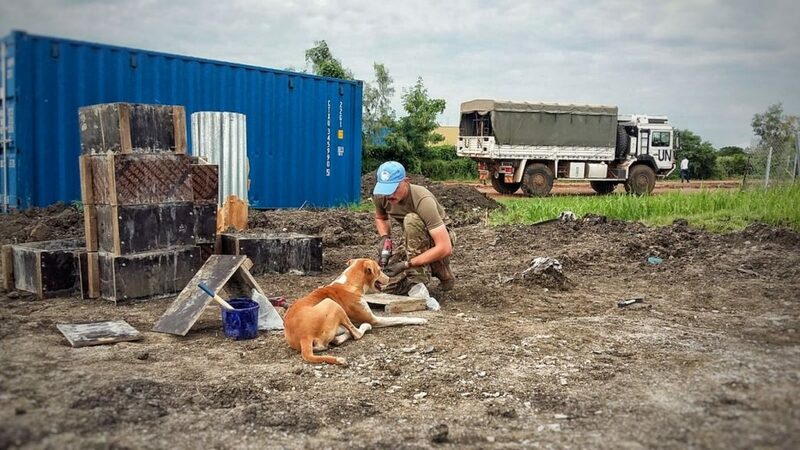 One of the first live taskings we were assigned was the construction of contractor accommodation within the main UN encampment, at a site known as MSA 6. The accommodation we were building consisted of a lightweight prefabricated structure with a floor plan of 4m x 7m. The steel framework, structural fittings, exterior finishes and tools for two of these buildings were delivered to site within a single ISO container. These structures were designed to be constructed by hand in compressed timescales and as such were perfectly suited for use in developing countries. Initially we were able to build a house from foundations to first fit in just over 2 days. After a month or so working on the buildings we were able to complete a building in one and a half days. In addition to the raw materials for construction these houses, the site also came with a friendly stray ‘Fenton’. Being British soldiers on operations, we immediately befriended him and he soon became part of our daily routine, sitting in awkward places and following us around site. 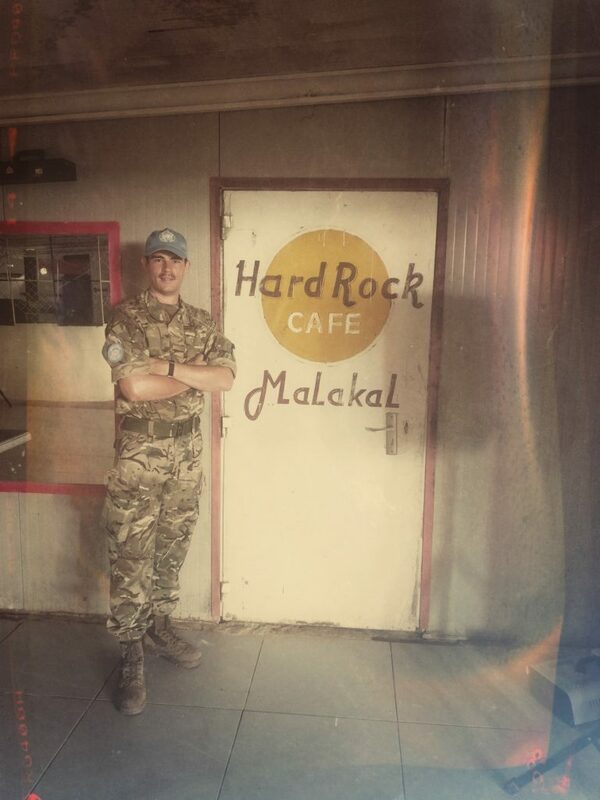 Close to the MSA 6 site is a UN welfare facility, locally known as the ‘Hard Rock Café’. Hearing the name ‘Hard Rock’ many of us had grand expectations for what would await us on our first visit. As it turns out it’s nothing more than a wriggly-tin shed where you can get a brew or a can of soft drink. The Hard Rock franchise either doesn’t know it exists, or do not have the heart to tell them to change their name. It does however have the promise of a disco in the evening, but to our knowledge no-one has been brave enough to see what it’s like. 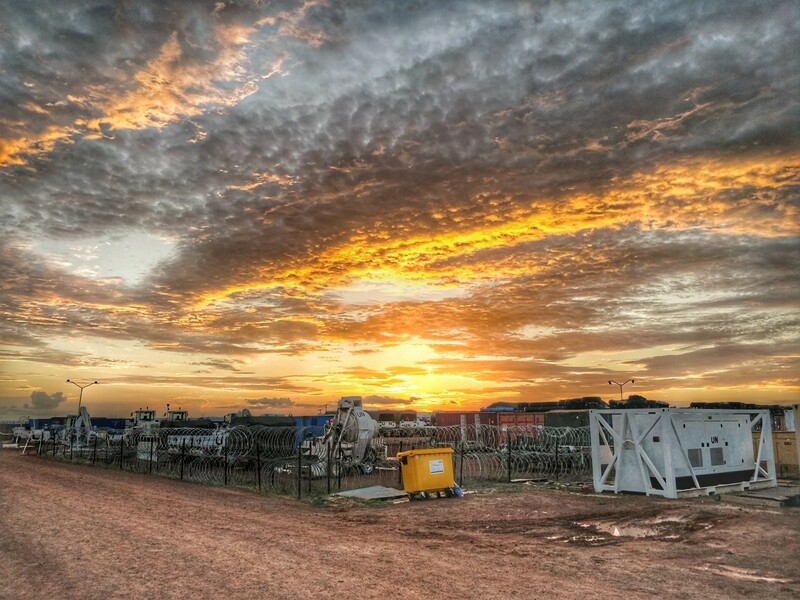 In addition to the construction of contractor accommodation, our sister troop was tasked with reinforcing the perimeter of the Tri-Star petroleum site. This required the excavation of an anti-vehicle trench and the placement of a type 1 fence. The task on first appearance seemed very simple; there were however additional challenges we faced on site. The task site was in close proximity to the Internally Displaced Persons (IDP) camp, separated only by a dry drainage channel. 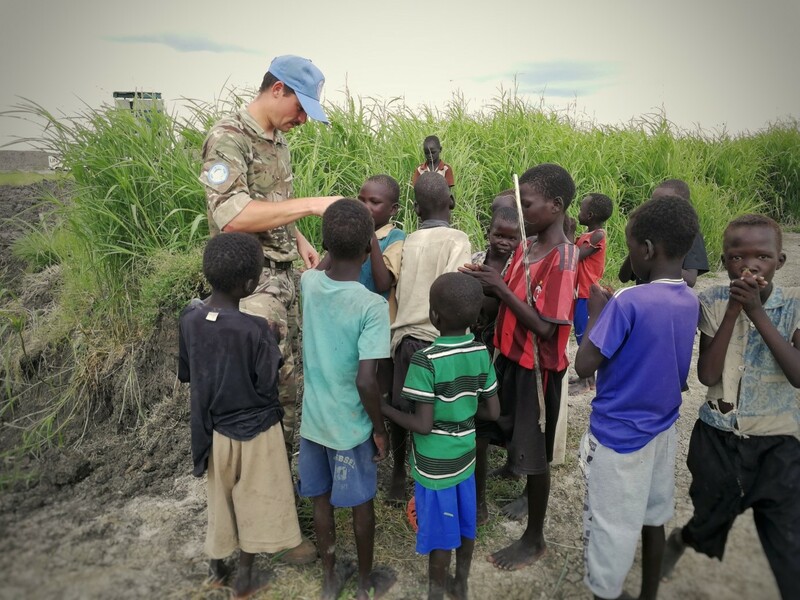 Many of the children live in poor conditions within the POC camp and as such the arrival of a few British soldiers is a great source of entertainment. Our role as such was to ensure the children remained at a safe distance from the plant and wiring, in order for others to do their job. Trying to keep the kids entertained was a challenge, as they don’t get many opportunities to play they were very boisterous and excitable. I managed to keep them entertained (for a short period of time) by showing them how to put a blade of grass between their thumbs and make a buzzing/whistling noise. Within half an hour they were all making a myriad of sounds, at least it kept them safe and away from the plant. As a task force we are still finding our feet and getting comfortable with the role we’ve been given. This week however sees the first engineering reconnaissance into Malakal town. The purpose of this recce is to identify area of the civil infrastructure has been damaged, and how as an engineering task force we can help rebuilding the town. This will make a pleasant shift from supporting the UN operations to being part of the rebuilding of South Sudan.